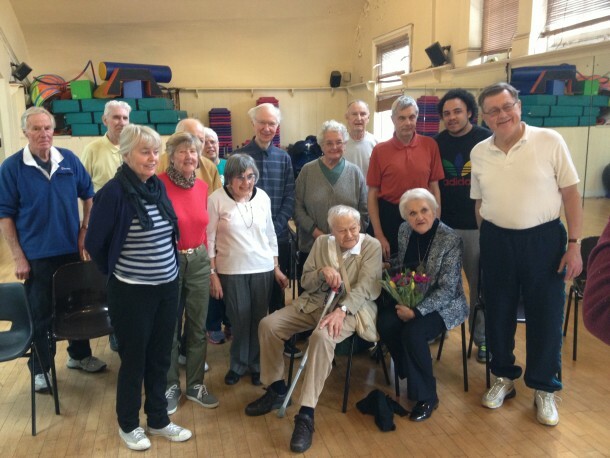 On Monday 3rd March, the Heart-to-Heart (H2H) group of cardiac rehabilitation patients met at 11am for their regular morning exercise session at The Armoury. But today there was a difference. Today the group was remembering one of their most committed and enthusiastic volunteers, Jon Stanton, who served as their Honorable Treasurer for over 20 years, and who sadly passed away in 2013. The H2H group was established in 1993 to provide gentle rehabilitation activities for patients who had suffered a heart attack and been referred by the Royal Free Hospital. Since then, there have been more than 20,000 individual attendances and hundreds of local Camden residents have benefited from the scheme, which has been administered by volunteers and is affiliated to the British Heart Foundation. When Jubilee Hall Trust (JHT) – the charity who manage The Armoury – were faced with eviction in 2012, John was one of the first to offer support and wrote poignantly about the work that Heart-to-Heart did, and how it had changed so many lives. Sadly John didn’t live to see the Trust secure their tenancy, but there was a wonderful symmetry about the fact that The Armoury would ultimately be saved when the Royal Free Hospital Charity saw the public campaign and bought the freehold. The celebration for John was marked by the attendance of Vic Simons, one of the founder members of the group and a plaque was unveiled in honour of John by the guest of honour, his widow, Connie Stanton.